You may have seen a captcha on many web forms, Captcha is a way to avoid the spamming via the bots. Captcha uses the image with text or numbers which is somewhat distorted. User can understand but is not possible for the bot to make the text corrosponding to that Image but human can understand and fillup the form. One of the same is google's recaptcha which is available with various language, here I will show the example with the php, integration of this. first of all you need to register your website with the recaptcha webpage here. Next you need to register the domain, to get a unique private and public key for your website. 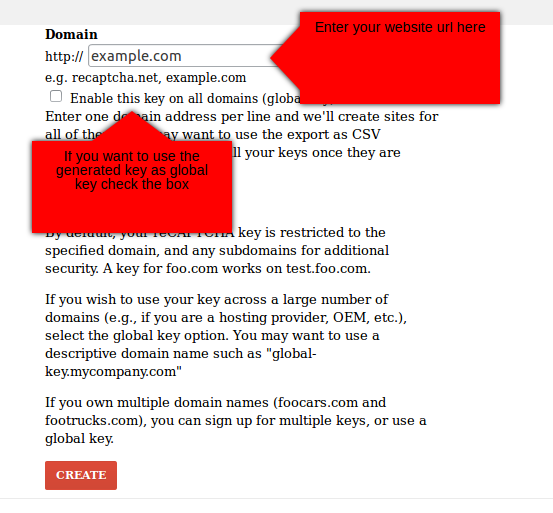 You can check the option to use the key for multiple domains. This will give you two keys a public key and a private key, keep them safe you will need these. As I am going to demonstrate this with php so I am going to use php plugin library. you can find all the libraries and plugins here. We are nearly set with the registration and prepration, lets do some coding now. demo.php - this is nothing but the final outcome, or you can say the place where form will be submitted. fourth is recaptchalib.php which is not created by me but is the actual google captcha plugin file. Don't forget to replace public key variable value with your own public key. You may have noticed that I have used two id's to fetch values, but the id's does not exists anywhere on this file. Well, you don't need to worry about that, these are the fields generated by the captcha library on the page. I have used the jQuery post method to reduce my work please feel free to do whatever change you like to do. Again don't forget to replace the "your private key here" with your actual private key. This is simple php I don't think I need to explain much about this, rather you will get this file as it is from the recaptcha page. finally last file done.php, your contol will finally move to this file when the captcha is verified. I have used jquery to submit the form, this is actually because I am using ajax to verify, If you want to use the serverside verification you don't need to do much, you can just place the captcha script inside the form element and on submit it will be verified.